The Lone Worker Transmitter is worn on a belt or pocket and held in place with a sturdy belt clip. It transmits an alarm message when the panic button is pressed. The transmitter also contains a tilt switch so that an alarm message is transmitted automatically if the person collapses for any reason. The automatic transmission occurs after a 20 second period during which a warning beeps give an alert that a alarm message is about to be transmitted.The message transmission is cancelled automatically by movement of the transmitter. Radio range is up to 500 metres with standard antenna. A radio repeater can be installed on large sites to increase the range between lone worker transmitters and receiver. Wireless Panic Alarm Button, works with all receivers. 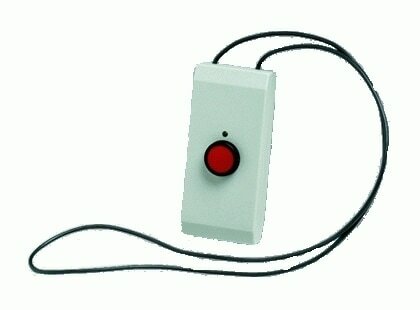 ​This is a panic button - no man down feature.